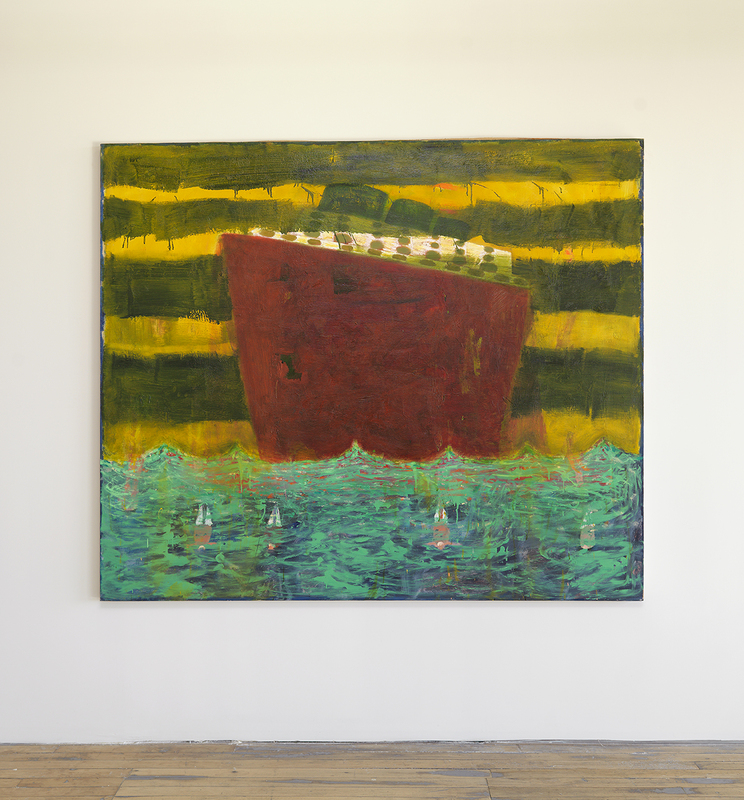 Katherine Bradford presents a series of large paintings depicting foreshortened views of hulking ocean liners solitarily moored on the open seas. The horizon in Ship on a Rust Sea (2013) is barely articulated. In fact, it is so swathed in atmosphere that the edges of the forms seem to be sinking in from all sides. These vessels, reduced to dark ungainly trapezoids and beacons of light, play with the quotidian humbleness of genre painting and (like her Superman (2011–12) series) invert heroic symbols into monuments of vulnerability. Katherine Bradford, “Deep Sea Divers,” 2013. Oil on canvas, 68 x 80″. Courtesy of the artist. Photo by Brian Buckley. Despite the looseness of the paint handling, the strokes of color take on the observed quality of light at night. In Ship on a Rust Sea, the scumbled surface of the ship’s dark hull leaves pores of bright red and orange paint showing through the brackish indigo glaze. Sources of light are superimposed as daubs of contrasting color capped in white that sit slightly off-register and wavering. The fluctuations of color modify the invented colors of the ship’s hull. They are painted with an ease and sensitivity that makes these depictions of reflected light seem deeply internalized. Bradford’s hand is everywhere. The surfaces are infinitely inflected with local differences of color and texture. Thin layers of pigment rubbed into the surfaces stain their surroundings, and accumulate within the multidirectional brushstrokes of painted under-layers. In Deep Sea Divers (2013), passages of transparent Alizarin and Red Lake glazed over a ground of Sap Green alters the hue to a blood-colored coagulate at the intersections and pushes a golden-ochre halo to the edges. Bradford’s tonal breath control makes everything felt, flush, and changeable, and in these moments Bradford’s subject matter recedes into the realm of pure painting.